They've been spotted several times now, arms entwined and with that special look reserved only for each other. John Rendall of Christian the Lion fame and top publicist Glen Marie Frost. tSS encountered them at the launch on Thursday night of Tony Graziana's Maserati show rooms in East Sydney, at the opening of a Darlinghust Thai restaurant a month ago and cruising down Macleay Street in Potts Point in Rendall's classic Rolls Royce last week. Glen Marie sat quietly in a mezzanine corner to watch John's daughter Tallulah sing a fortnight ago at a Newtown cabaret club while downstairs John greeted and schmoozed a well heeled guest line-up like film producer and wine heiress Rebel Penfold Russell, Constance Farquarson, and Angela Belle McSweeney. 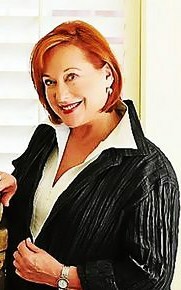 For years Rendall wrote social columns for magazines in Britain, like London Portrait Magazine and the top glossy, Hello. He was friends with the famed gossip writer Nigel Demspter and with then wife & publicist Liz Brewer, co-host on 'Aussie Ladettees to Lady', helped organize shindigs and restaurant launches. In between he and Liz bought and sold London houses after renovating them. In 2007 a youtube film of he and former partner Anthony 'Ace' Bourke greeting their pet lion in Africa in 1972 when ballistic with a few million hits and catapulted the 2 into instant fame. A book deal followed along with film and product endorsement deals which saw the cash rolling in with appearances around the world on dozens of TV chat shows including Oprah Winfrey and The View with Whoopi Goldberg. At present he tours and speaks about African wildlife. Rendall also shared a commune in the 70's in the British countryside with friends like Helen Mirren and landscape gardener Roddy Llewelyn who conducted a love affair there with the late Princess Margaret. Glen Marie's business and political credentials are impeccable. One of the best liked PR ladies about town she hosted the corporate sector for the 2000 Sydney Olympics and counts Lady Sonia McMahon and just about every top Liberal Party politico as friends. Lately she has joined an outfit called the Corporate Intelligence Analyst Network whose website says it is "a group that represents more than 150 years of collective experience drawn from a pool of "specially trained intelligence and federal law enforcement personnel". Glen-Marie hates being called a socialite which she is, and she hates being in the social pages-where she constantly appears. She says she likes a quiet life away from the glare of publicity and social events. Ahhh.. Just like John. A match made in heaven. 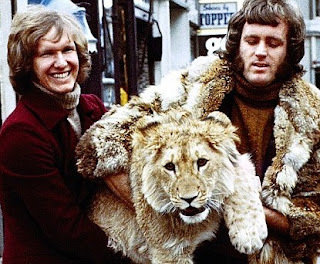 Ace Bourke, Rendall and Christian the lion in the Kings Road London circa 70's.